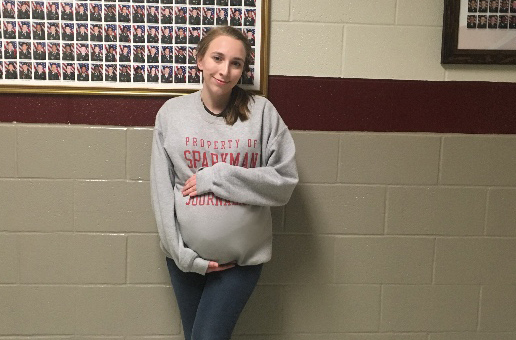 Sophomore Madison Duboise learns how being pregnant can affect one's life. Teenagers don’t usually envision their typical day at school caring around 25 pounds of weight and not being able to see their feet while walking. However that’s what my day consisted of. I am taking the course family and consumer sciences and for one of our assignments we can choose between wearing a pregnancy vest or a writing assignment about pregnancy. I chose the one that seemed the easiest, boy was I wrong. I arrived at school thinking I was prepared for this assignment. It was only one day so I thought it would be over quickly. I walked into my family and consumer sciences class to see Mrs.Webster putting a vest on another girl. It looked absolutely horrifying. There was a tightening band that goes over your shirt and under the vest. It is used to stimulate the pressure of being pregnant. On top of the band goes the vest, with three sets of straps along the back to hold it in place, along the shoulders there are Velcro straps to help keep it on your shoulders. Over that I put on a larger T-shirt to cover it up. It was very strenuous on both my back and shoulders, the pressure from the tightening band is absolutely awful, it felt like my organs were being squeezed. The weight of the vest actually made me cry once that morning, I had never carried something that heavy for such a long period of time. I got it put on at 8:31 a.m. and didn’t get it taken off until 3:20 p.m.. That was six hours and 49 minutes of wearing the pregnancy vest. Wearing the vest put me in a bad mood because my back and shoulders were hurting and it made me feel really overwhelmed and stressed. It was a big struggle to walk up the stairs because I couldn’t see my feet so I had to get someone to help me. Also not being able to sit in a desk properly was really irritating because I had to turn my head to look at the board, I was not able to bend over normally so I had to squat to pick up anything and I couldn’t move around the classroom or halls easily because the vest was so large and uncomfortable. Throughout the day the vest started leaking so the shirt I had on underneath and my pants got completely soaked in water. Not being able to have a normal day and stick to my usual routine was an overall frustrating experience. From not being able to move around with ease, having to rely on others to help me and to everyone asking to touch the vest was a unusual experience. However the irritating question “Are you really pregnant?” from random students did spark some interesting conversations. Today I learned just some of the physical demands of being pregnant as a high school student, I can’t even begin to imagine the emotional, social and financial strain on top of what I experienced today.